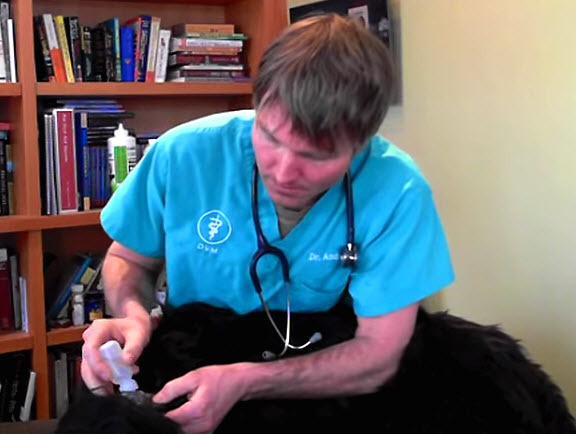 Clean your dog’s infected ears with a vinegar solution! Put your dog on a table or sit next to it on the floor. Look inside your dog’s ear for any colored discharge that could indicate an ear infection, as well as any pink areas of the skin that are raw or hurt. If your dog has any pink spots, first gently wipe some olive oil onto them to prevent them from hurting when they come in contact with the vinegar solution. Mix together equal parts of white vinegar and water in a squirt bottle. Flip your dog’s ear flap up over their head, cup the area under their ear with one hand, and use the other hand to squirt a couple teaspoons of the solution into your dog’s ear canal. Massage around the sides of your dog’s ear with your fingers to work the solution deeper into the canal. Gently press a cotton ball into the ear canal to soak up the liquid.